In Blake for spring 1977 it was hinted that two further developments were imminent in the rediscovery of James Jefferys.1↤ 1 Martin Butlin, “The Rediscovery of an Artist: James Jeffreys 1751-1784” in Blake Newsletter 40 (Spring 1977), pp. 123-24, two drawings repr. Both have now appeared in the April 1977 issue of The Burlington Magazine. The first article, by John Sunderland, reports the discovery by Timothy Clifford at the close of the Jefferys exhibition that the drawing formerly accepted as a self-portrait from behind by John Hamilton Mortimer in fact shows a figure holding a drawing by Jefferys included in the exhibition.2↤ 2 John Sunderland, “Two Self-Portraits by James Jefferys?” in Burlington Magazine, 119 (April 1977), 279-80, the two drawings repr. p. 281, figs. 76 and 77. It was also clear that the drawing was inscribed in Jefferys’ hand, including the address “To Mr. Benchley,” Jefferys’ early patron at Maidstone. The conclusion is that both this drawing, now in the Mellon Collection at Yale, and the companion self-portrait seen from the front, in the National Portrait Gallery, London, are by Jefferys. It is interesting that Sunderland had already suspected that other so-called Mortimers from the same source as these two drawings were not by him; one can now look for a strongly Mortimeresque phase in the development of Jefferys’ very eclectic style. This may be still more eclectic than has been supposed. The other article was by Nancy L. Pressly, identifying Jefferys with the mysterious “Master of the Giants.”3↤ 3 Nancy L. Pressly, “James Jefferys and the ‘Master of the Giants,’” ibid., pp. 280-84, drawings by Jefferys, including some formerly attributed to the Master of the Giants, repr. pp. 282 and 285, figs. 80-86. Various attributions to such artists as Prince Hoare have proved untenable and, although Mrs. Pressly’s identification has not yet been whole-heartedly accepted in all quarters, it seems convincing to me. The sketchy treatment of the background figures of the “Master of the Giants” drawings, perhaps more than the more consciously finished foreground figures, seems particularly close to Jefferys’ style; a distinctive manner of drawing kneecaps is a characteristic feature of both groups of drawings! It is good news that Mrs. begin page 299 | ↑ back to top Pressly is continuing her study of the activity at Rome in the 1770s of such artists as Fuseli, Sergel, Alexander Runciman, John Brown, Romney and Mauritius Lowe: the teribilità, forceful rather than accomplished, of much of Blake’s work in the 1780s seems to owe as much to these artists’ revival of Mannerism as it does to the more orthodox tenets of Neo-Classicism. MARTIN BUTLIN, KEEPER OF THE BRITISH COLLECTION, TATE GALLERY, LONDON. 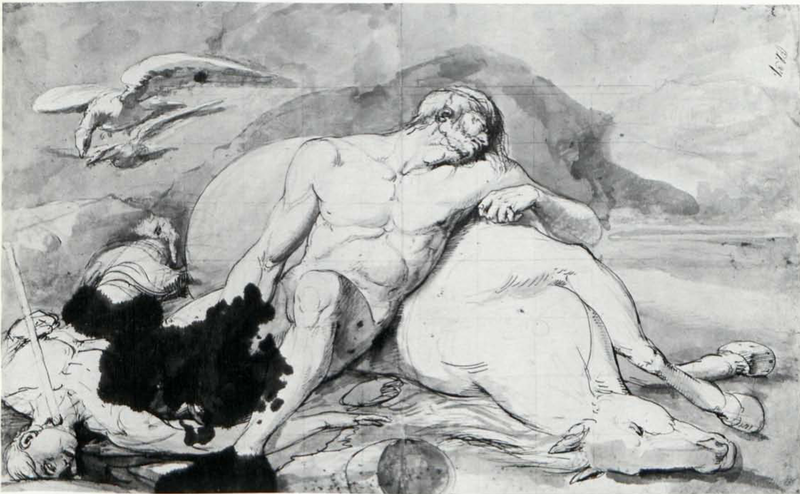 James Jefferys, “Fallen Warrior lying against a Dead Horse.” Pen and grey wash over pencil 19-¾ × 30-¼ (50.1 × 76.8) Maidstone Museum and Art Gallery.